Work donated by some of the nation’s leading Modern and Contemporary artists will be sold at auction in the coming fortnight in support of Pallant House Gallery’s £1 million match funding grant. The grant was made by the Heritage Lottery Fund (HLF) Catalyst and Endowments funding program. The grant is conditional on Pallant House Gallery matching pound for pound the £1 million grant with money from private funding by 2016, and their target is in sight! The first lots under the hammer are at Sotheby’s this week in London, in their Modern & Post War British Art sale. 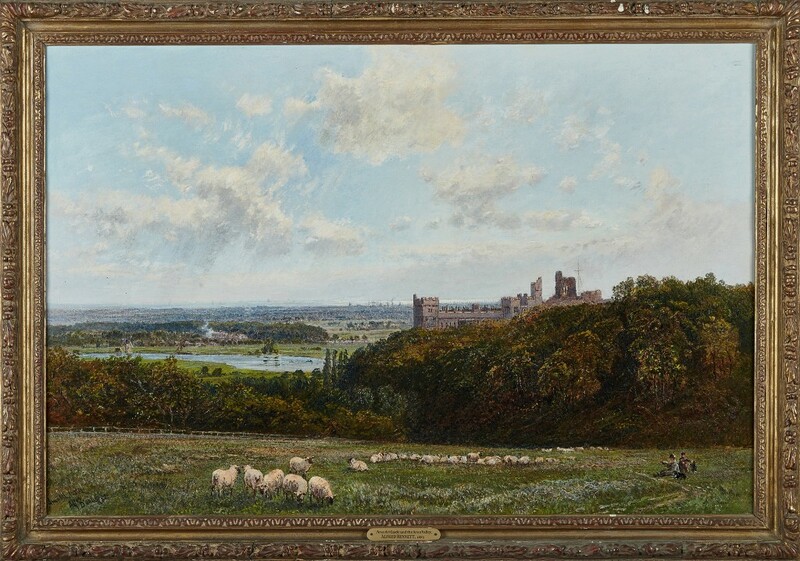 Closer to home a second auction of works is being held by Toovey’s Fine Art Auctioneers. 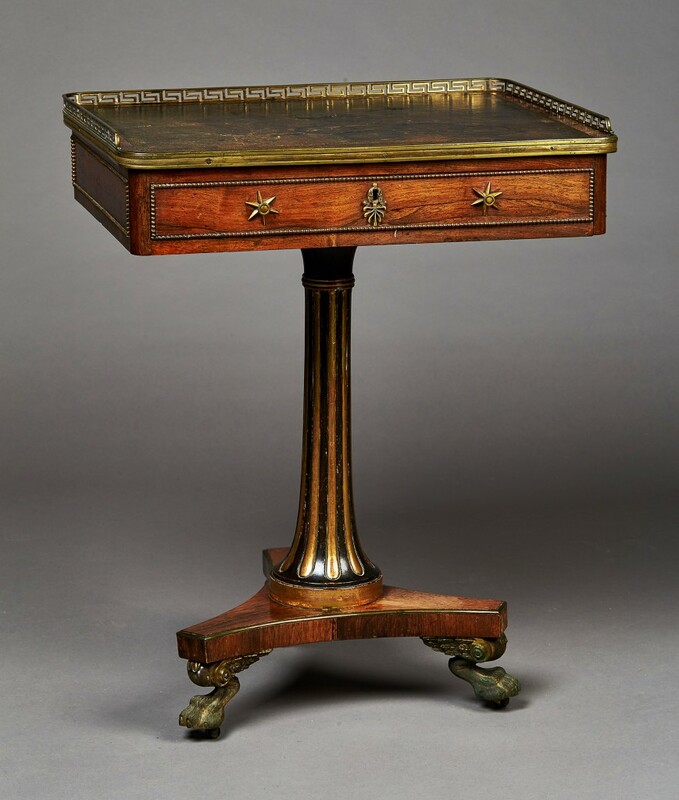 Bidding has just gone live for this on-line sale. Work has been donated to the auction by artists and patrons. Lots include pictures by Norman Ackroyd, Peter Blake, Patrick Caulfield, Dennis Creffield, Laura Ford, Anna Fox, Jeremy Gardiner, Henry Inlander, Kurt Jackson, Ed Kluz, Henry Moore, Celia Paul, Eduardo Paolozzi, Bruce Rae, David Remfry and Bouke de Vries. Many of these artists are represented in the gallery’s own collection, or have strong associations with Pallant House’s work. 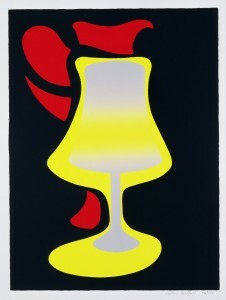 Amongst my favourites is the bold screen print from 1992, ‘Red Jug and Lamp’, by Patrick Caulfield. The striking economy of line used by this English painter and printmaker is typical of his work. 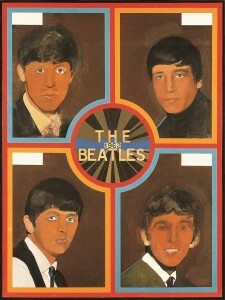 The screen print ‘The Beatles 1962’, by Sir Peter Blake, is a final stage proof signed by this leading British Pop Artist. This iconic image was commissioned by Pallant House Gallery in 2012. I love Ed Kluz’s work. His pictures provide a fresh voice in the British Romantic tradition. He reinterprets the picturesque uniting us, in our imaginations, with our sense of place in the procession of human history. This talented artist, illustrator and designer brings an antiquarian’s eye to our topography and architecture. 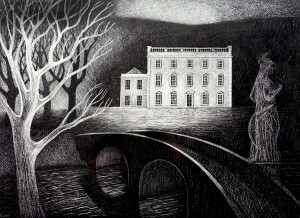 The aesthetic of Ed Kluz’s ‘Ilford Manor, Somerset’, donated by the artist to the sale, captures his thoughts and emotional response, as well as the essence of the physical reality. These themes and responses belong to the Romantic tradition. Kluz seeks to look beyond what is immediately apparent, to the spirit of the place. 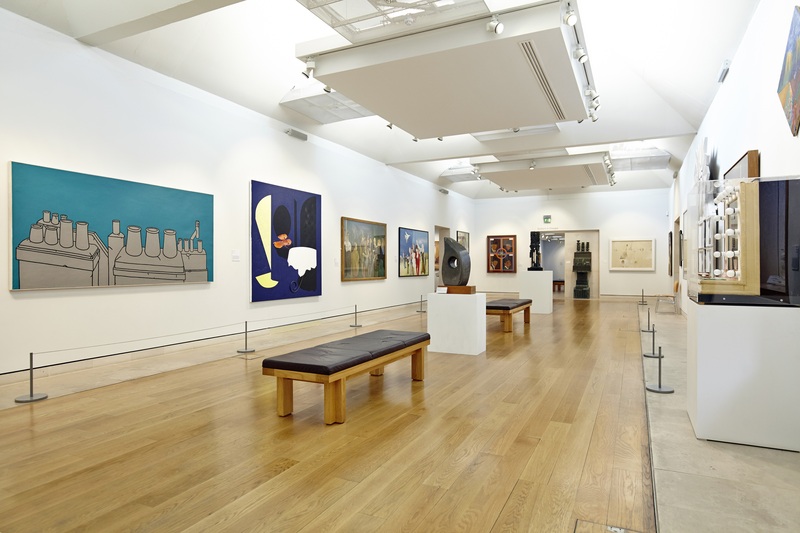 The funds from the auctions will go to Pallant House Gallery’s endowment fund which was established in 2002. Pallant House Gallery receives no direct subsidies from central Government. 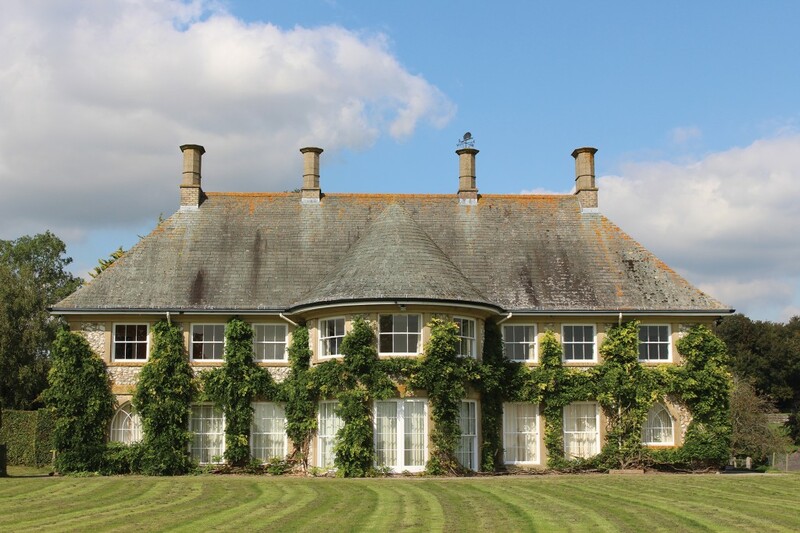 The appeal aims, with the HLF Catalyst Appeal match funding, to consolidate a secure funding base to ensure the gallery is able to continue to deliver its successful exhibitions and award-winning learning and community programmes, as well as conserving its important collections. I am delighted that Toovey’s are donating their expertise and services to this important appeal. 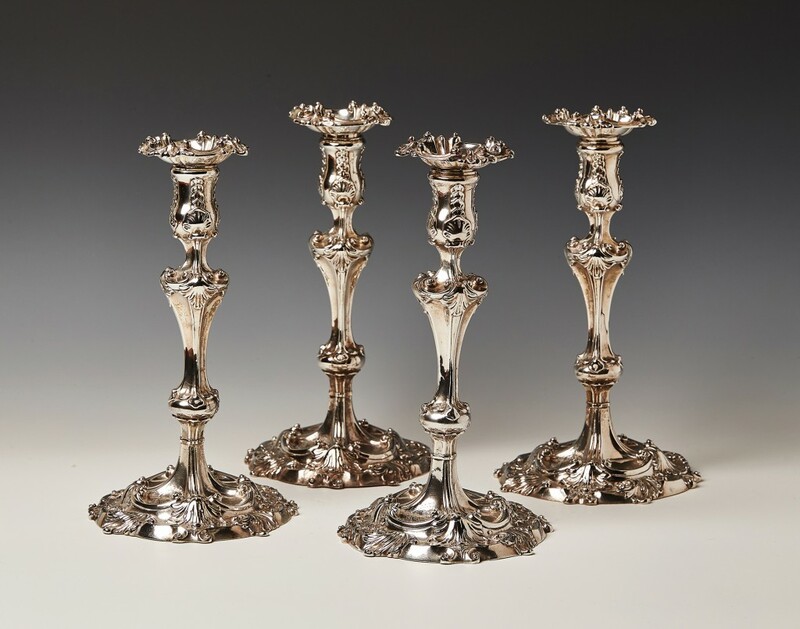 Lots being auctioned by Toovey’s will be on view at Pallant House Gallery, 9 North Pallant, Chichester, PO19 1TJ, from 20th to 27th November 2015. All the bidding is on-line and finishes at 7.30pm on Friday 27th November 2015. You can bid on-line by clicking here, registering, and clicking on the sale. By Revd. Rupert Toovey. Originally published on 18th November 2015 in the West Sussex Gazette. I am delighted that Toovey’s are donating their expertise and services to this important appeal. Lots being auctioned by Toovey’s will be on view at Pallant House Gallery, 9 North Pallant, Chichester, PO19 1TJ, from 20th to 27th November 2015. All the bidding is on-line and finishes at 7.30pm on Friday 27th November 2015. 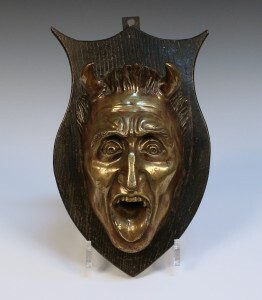 You can bid on-line by going to www.the-saleroom.com/en-gb/auction-catalogues/tooveys, registering, and clicking on the sale. 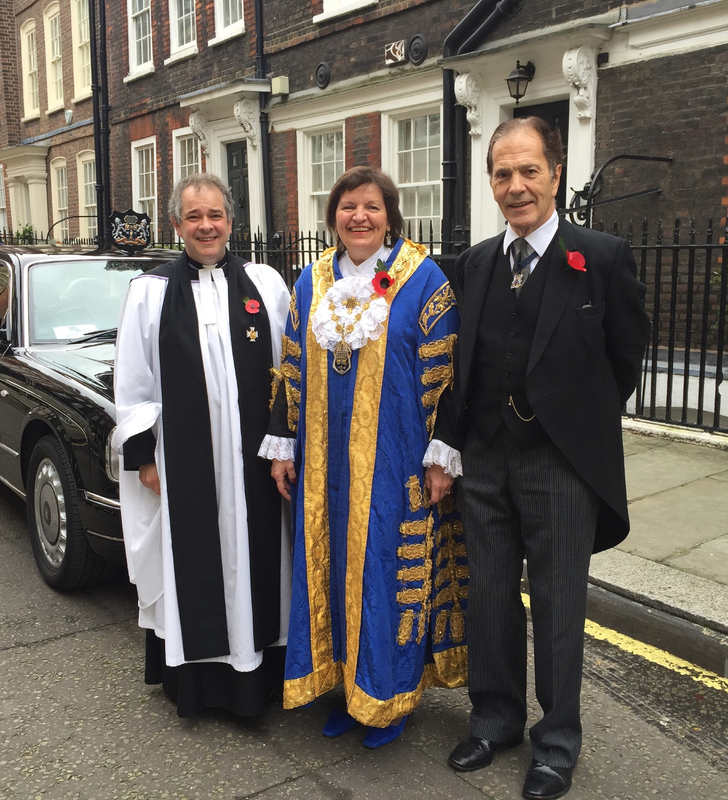 Last weekend I found myself at the heart of the nation’s acts of remembrance in London as Chaplain to The Lord Mayor of Westminster, Lady Christabel Flight. The wife of former Arundel and South Downs MP, Lord Flight, Christabel is bringing her undoubted energy, talents and qualities to the role of Lord Mayor of Westminster. On Sunday morning Lady Flight joined with leading military figures in laying wreaths of remembrance in a private ceremony. We entered the Abbey passing before the assembled ranks of veterans and serving service men and women. 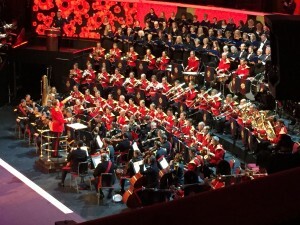 There seems to have a been a particular poignancy to the Remembrance celebrations throughout this year as we have commemorated the 70th Anniversary of Victory in Europe and 75 years since the Battle of Britain was fought over the skies of southern England. 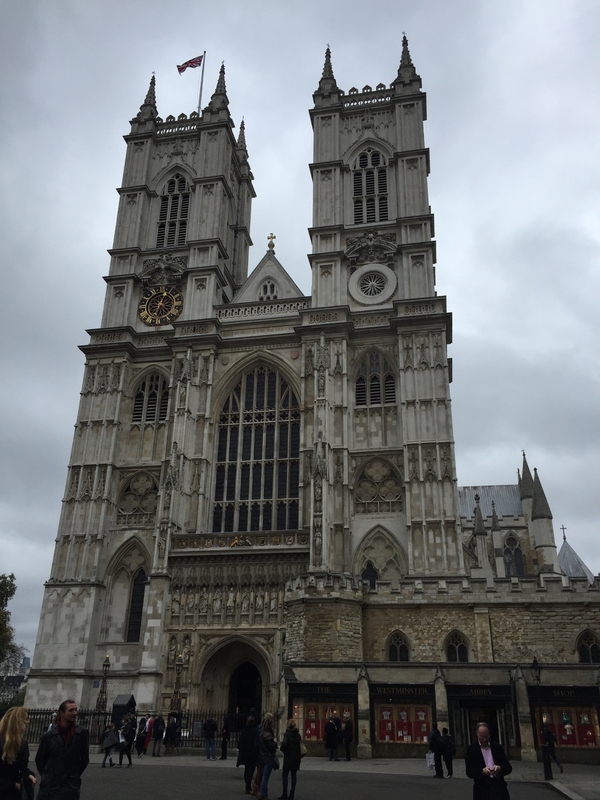 We gathered in the west end of the Nave of Westminster Abbey standing beside the grave of the Unknown Warrior, whose body was brought from France to be buried there on 11th November 1920. The grave, which contains soil from France, is covered by a slab of black Belgian marble from a quarry near Namur. 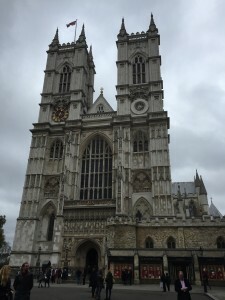 On it is an inscription, composed by Herbert Ryle, Dean of Westminster, which includes the words ‘MAN CAN GIVE LIFE ITSELF, FOR GOD, FOR KING AND COUNTRY, FOR LOVED ONES HOME AND EMPIRE, FOR THE SACRED CAUSE OF JUSTICE AND THE FREEDOM OF THE WORLD’. As Big Ben rang out 11 o’clock, and the familiar canon rumbled in the distance, in the silence there was an overwhelming sense of the long shadow of history and our place in the procession of human history bound up with faith and nationhood – a tangible sense of loss and gratitude. These commemorations combined familiarity with reverence. I hope that each of us will be able to find time in this Remembrance Day and week to reflect and offer thanks for the courage of successive generations who have been called, and continue to be called, to fight for the greater cause of justice and concord. By Revd. Rupert Toovey. Originally published on 11th November 2015 in the West Sussex Gazette. I am in the Channel Islands visiting family as I write this week’s column. My cousins, the De La Hayes, today, decided to take me to St Matthew’s. The church exterior has been described as the ‘the ugliest church in the Island’. But it has hidden delights for those who venture inside! St Matthew’s is to be found at Millbrook halfway round St Aubin’s bay, on the south coast of the island of Jersey. It has been a grey day and the fine drizzly rain enfolded us as we walked from the car park towards this plain, concrete clad building. Nothing of the exterior prepares you for what awaits inside. The interior is entirely decorated with Lalique glass. As you come into the church you are gathered into a space of great peace and light. The unity of design afforded by the work of the famous Parisian glass art designer René Lalique, and the Jersey architect A. B. Grayson, is unexpected and beautiful. Behind the altar the illuminated four metre high glass cross is decorated in relief with lilies. The Madonna lily motif is repeated throughout much of the glass decoration. 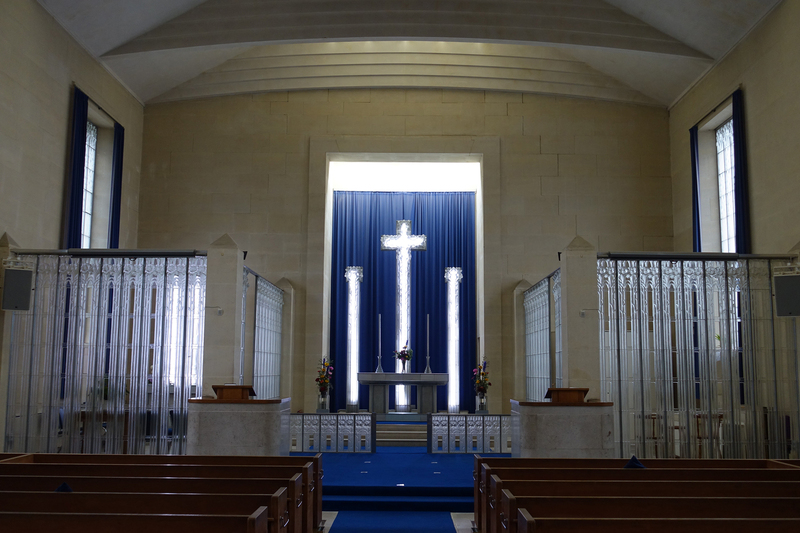 The cross is flanked by two glass pillars creating a scene which brings to mind the Crucifixion. The Lady Chapel and Vestry are enclosed by glass screens. The Lalique font lends an intimacy to this sacred space. 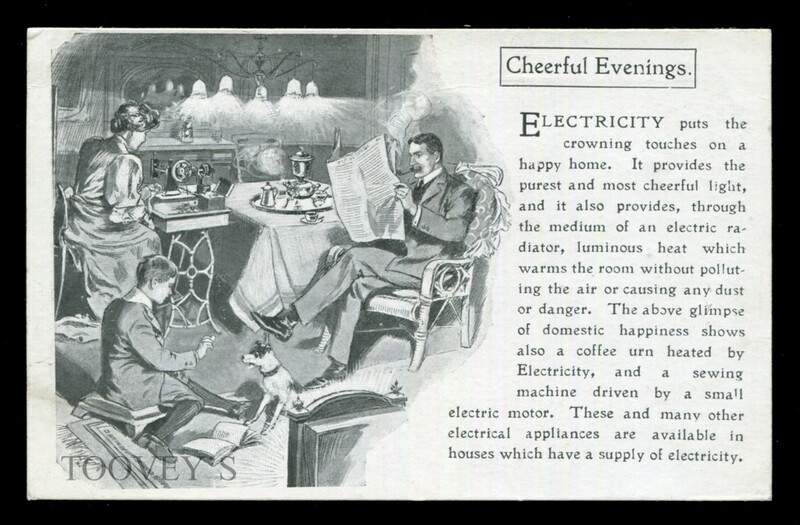 The interior was transformed in memory of the first Lord Trent, Jesse Boot, who founded Boots the chemists and lived in Jersey with his wife Florence. René Lalique and the Boots met in the South of France where they were neighbours. The Lalique glass works were famous for their bold Art Deco designs on vases, bowls and decorative objects. 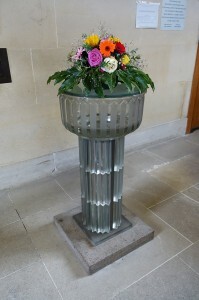 René Lalique was delighted when Florence offered him the commission to decorate St Matthew’s, near Villa Millbrook her Jersey home, to the glory of God and in memory of her late husband. Lalique had accepted a commission in 1930 to redecorate La Chapelle de la Vierge Fidèle a la Deliverande at Calvados which was severely damaged during the Second World War. 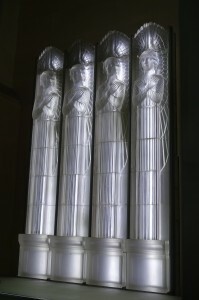 This design incorporated six pillars crowned with Madonna lilies, six angels formed the reredos and there was a fifteen panel glass communion rail. All these elements from the French chapel were assembled in the Pavillon de Marsan at the 1933 Paris Exhibition. Many of the components of this earlier design appear to have been incorporated at St Matthew’s, which provides the best surviving example of Réne Lalique’s important glass interior designs. The refurbished St Matthew’s church was completed and dedicated in September 1934. I am drawn to the Lady Chapel. 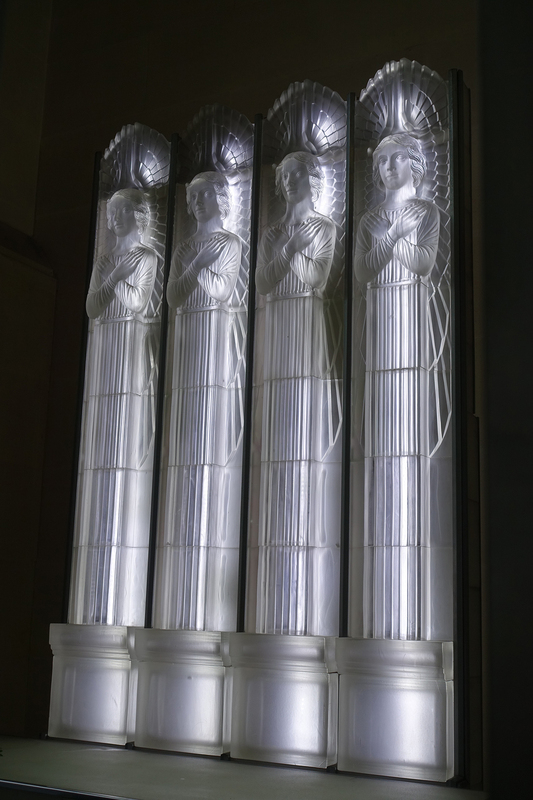 The heavy glass panel opens smoothly revealing the breath-taking reredos formed of four sculptural Lalique glass angels. Their arms are crossed framing their faces which express a timeless serenity. These monumental figures lead your eyes heavenwards as you pause in prayer, gathered in a space radiant with light. On Remembrance Sunday we will reflect on the courage of those who fought, and continue to fight and give their lives, so that we might live in freedom. The courage of the Allied forces who fought in the Second World War liberated Europe and the Channel Islands from Nazi occupation. 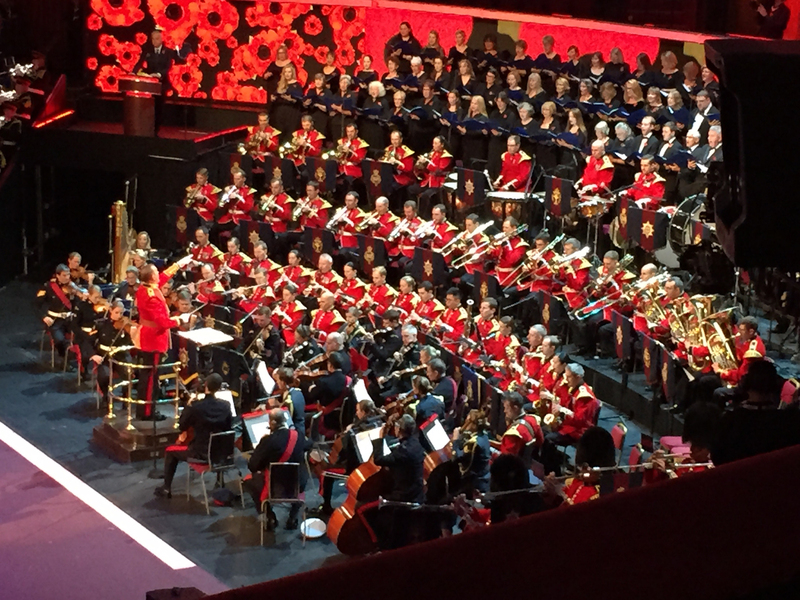 Our corporate acts of remembrance will take place in spaces like St Matthew’s, Jersey and at the Cenotaph in Whitehall, with familiar services marked by church and state. As we approach Remembrance Sunday each of us will reflect on points of love in our lives, and those we have loved and lost in acts of personal remembrance. By Revd. Rupert Toovey. Originally published on 4th November 2015 in the West Sussex Gazette.